I found these great MP3 players on Smartfun. They are pretty low cost, $49.95. Has a built in SD micro chip slot to load your music on. 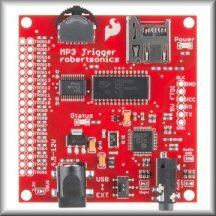 It can be triggered either by 18 external trigger pins or through serial commands. Great for adding sound to your project. I get to play with these wonderful little toys thanks to a good friend having a vision of starting a haunted house over a decade ago. I greatly enjoy the experience of learning how to make them do what I need for them to do. Sometimes it's easy, sometimes it takes weeks of looking at something to get it right. Here is my shield stack for Arduino Halloween Project. An Arduino UNO, ElecHouse MP3 Shield, a Screw Shield from DFRobot and finally a Relay Shield from Seeed. With the relay shield I had to use the screw shield, or come up with some other means to attach the external components. Click on the logo to discover great support to make your Halloween scare more consistant.